As this column was being written, a massive snowstorm was pounding the upper Midwest states, as reported with excited commentary by the folks at The Weather Channel. Pardon me if I don’t quite share their enthusiasm, as winter now approaches the Cape Region. Nice days for golf are dwindling, and if some predictions for the season are accurate, they might just disappear entirely until spring. 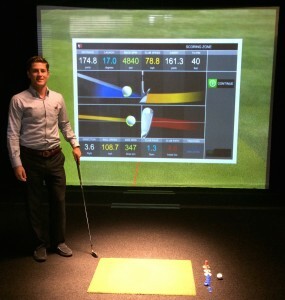 Ben Bateman of 365 Golf, with his new golf simulator business that opened Nov. 19. Fortunately, Ben Bateman and his new 365 Golf Simulator venture can help avid golfers maintain their swing, learn more about their game, and have a lot of fun playing golf in perfect, indoor conditions. I went to one of Bateman’s open houses during the week of Nov. 13, with the reservation-only business formally opening Nov. 19. Bateman is partnered in a finance/accounting business with his grandfather, Terry Dorey, with 365 Golf as a side venture at their Rehoboth satellite office on Route 1. The Full Swing Simulator system he uses takes up a fair amount of space, but there’s plenty left over for couches, a TV screen, and other amenities for golfers to enjoy while their buddies take their turns at the tee. When I arrived, the system was set up for wedge practice to a downhill green 42 yards away. The green’s “slope” wasn’t immediately evident on screen, until a shot would land on it and the rolling would start. Batemen used his 60-degree lob wedge, and I used my 54-degree sand wedge. We were both able to get as close as 4 feet from the hole several times, but some of our other attempts weren’t nearly as impressive. That’s a good thing, actually, if you want to use as realistic a simulator as possible. This device can faithfully recreate the effects of a bad swing or mishit. I can vouch for this from repeated experience, and not just with wedge shots. Bateman reset the machine for us to play the front nine at Pinehurst No. 2, and it was a lot of fun, despite some iffy swings. It turns out that my duck hooks travel 182.2 yards into the left rough, about 40 to 50 yards short of my better drives. Bateman and I also proved that a simulated golf ball can and will ricochet off simulated trees, and sometimes into nasty simulated lies. My one par of the evening was actually pretty typical of my regular game. On a 212-yard par 3, I hit a 3-wood left of the green, 25 yards from the hole, and made a nice chip to gimme range. Bateman admits to an 8 handicap, while also making sure to let me know that his brother Michael is a 10. Ben’s drives often traveled 270 yards, while my best went about 235. The computer data display showed us the blunt reason for the difference in results—his swing speed at impact was 109 mph, and mine was 93. Although playing the golf course was fun, I think the other options for the simulator could be far more useful for golfers trying to maintain their swing or improve their game. The simulated driving range shot data provides the same essential information as a launch monitor, including speed, spin, and carry and roll distances. This is a great way to “gap” your clubs. By hitting multiple shots with each iron, the average carry distance data will show if your current clubs and swing aren’t giving you the recommended 10-yard intervals. The restricted-distance yellow balls found at Cape Region practice facilities can’t really provide the same information. In addition, the perfect “weather” on the simulator is a rare treat in the real outdoors. The short game practice option that Bateman and I tried, in our case from 42 and 62 yards, is also a good way to fine-tune your ability to hit partial shots from a relatively tight lie. This skill usually is the hardest part of the game to come back after a winter break. Given that most of us (other than Bateman) tend to miss the greens on a regular basis, the short game simulator set-up should be a big help in maintaining or improving this part of your game. The pricing scheme is pretty straightforward: $40 per hour for one player, $60 for two, $70 for three, and $80 for a foursome. By using a generous “gimme range” in the course set-up for putts finishing ten feet from the hole, it should be possible to play 18 holes in about an hour. For the upcoming holiday season, Bateman is also offering gift cards, in whatever denomination desired. For more information, go to 365golfde.com, email Bateman at playgolf@365golfde.com, or call 302-727-0789.